This afternoon at the Conservative Agenda, Political Insiders were asking Charles Foster Kane if The Blower would be covering the 2019 Conservative Political Action Conference (CPAC) at the Gaylord National Resort & Convention Center in National Harbor, Maryland. “You Bet,” Our Beloved Whistleblower Publisher explained. “As the publication of record for all the political scrambling, speculation, mud-slinging, and back-stabbing in the Tri-state, our readers know to expect nothing less. President Donald Trump will be there, along with his Vice President, Mike Pence. Other speakers at CPAC this year include Reps. Jim Jordan, R-Ohio, Mark Meadows, R-N.C., and Sens. James Lankford, R-Okla., and Marsha Blackburn, R-Tenn. Republican National Committee Chairwoman Ronna McDaniel is also scheduled to speak, along with activists and former members of the Trump administration such as Turning Point USA founder Charlie Kirk and Sebastian Gorka, a former deputy assistant to Trump. Plus, all of the other important Republican political figures are scheduled to speak, with the rare exception of Ohio’s Delusional Ex-Governor and Ohio’s First and Second District Congressmen. Check out the complete list to see for yourself. Charles Foster Kane wishes CPAC 2019 would include a few kind words from The Blower’s all-time favorite CPAC Speaker, Governor Sarah Palin, like this one from 2013. “Sassy Sarah” Palin was prophetic and indeed ahead of her time. The Blower often wonders how exciting a Trump-Palin ticket would’ve been. 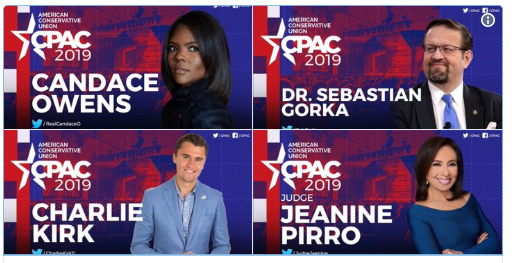 This Is Your Official “CPAC 2019” E-Dition. 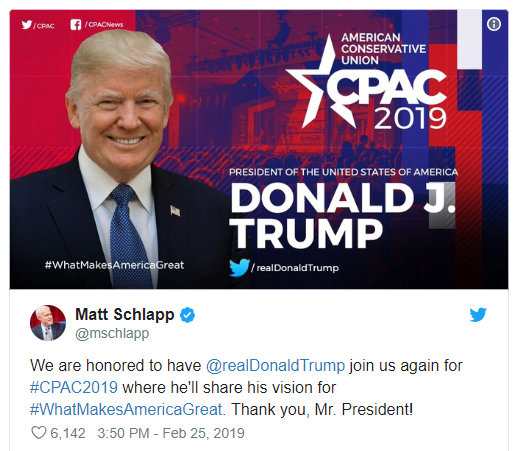 Any Other Publication Calling Itself The Official “CPAC 2019” E-Dition Is Surely A Fake. This entry was posted in Uncategorized and tagged Charlie Kirk, Conservative Political Action Conference, CPAC 2019, James Lankford, Jim Jordan, Mark Meadows, Marsha Blackburn, Mike Pence, Ronna McDaniel, Sarah Palin, Sebastian Gorka, Trump, Trump-Palin ticket on February 28, 2019 by charlesfosterkane.